LONDON (BLOOMBERG NEWS) • The European Championship, which kicks off on June 10, will feature some of the world's best - and most expensive - footballers: Cristiano Ronaldo, Gareth Bale, Thomas Mueller. Hungary's biggest stars will be there too, for the first time since 1972. However, in financial terms, they are in a different universe. Their 23-man squad would cost a combined US$31 million (S$42.8 million) in transfer fees, the least of any of the 24 countries competing. Cristiano Ronaldo, Portugal's 31-year-old captain, alone would command US$116 million, according to an analysis by Dutch bank ING. The Spanish team are the most valuable overall at an estimated US$736 million, followed by Germany at US$633 million and France at US$551 million. A record number of national teams will feature in the quadrennial tournament, which will be played in 10 cities across France. With the field expanded from 16 teams to 24, smaller nations including Wales, Northern Ireland, Iceland and Albania will make their debuts alongside traditional football powerhouses Spain, Germany, England and Italy. ING called attention to the most expensive player on each of the 10 most expensive national squads. That excluded Bale, who moved to Real Madrid from Tottenham for a record US$113 million in 2013, because the Welsh team overall do not crack the top 10. 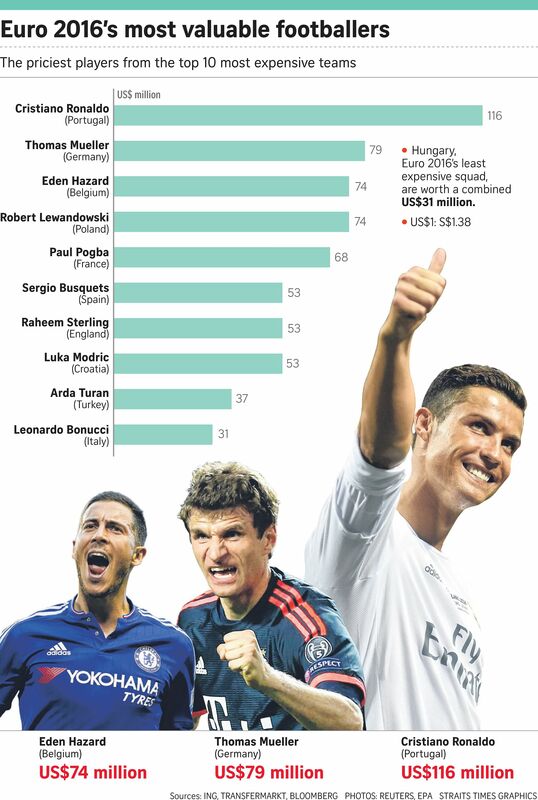 After Ronaldo comes Germany's Mueller, 26, worth US$79 million, followed by Belgian Eden Hazard and Poland's Robert Lewandowski, who are tied for third at US$74 million apiece, ING said, citing data from Transfermarkt.com. While Spain's players command the highest price as a group, fans and bookmakers favour Germany to win the tournament. Hungary are a 250-1 long shot, according to Britain's sports betting house Ladbrokes.